This vinegar-based slaw is an easy way to start a meal. Very refreshing in the summer! Pairs great with fish, dishes with avocado, and Central and South American dishes. Try apple cider vinegar or white vinegar for variations in flavor. Can be served immediately or marinated in the refrigerator overnight for a more pickled taste. 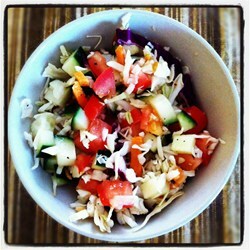 Toss coleslaw mix, tomato, and cucumber together in a mixing bowl. Whisk vinegar, Dijon mustard, and agave nectar together in a bowl until emulsified; season with salt and pepper. Drizzle dressing over the vegetable mixture. Turn the salad with a fork until vegetables are evenly coated in dressing.